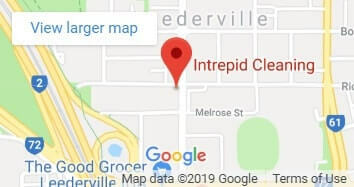 We talk a lot about our attention to detail here at Intrepid Cleaning. But sometimes, words are meaningless without concrete examples. We recently started cleaning for an office in the Subiaco area. The previous cleaners were happy to come in each day — after all the office workers had left — and simply replace the plastic bin liners under each desk… ignoring the filthy state of the ACTUAL BINS. After months of accumulating coffee spills, food waste residue, and general dirt and grime, some of the bins looked like they were harboring their own mini eco-system. It was enough to make you feel sick. The build up of dirt and food residue in an office bin can create health concerns, particularity in an office with limited circulation of fresh air. Not to mention the smell. Left for long enough, these bins can start to omit rather unpleasant odor — and in a confined office space with multiple people this can go south pretty quickly. Besides, you don’t want to spend 8 hours or more in an office that you KNOW could be cleaner, and have to settle for low standards. A clean office makes everyone feel great, provides the best start to the workday (excluding the morning coffee, of course) and can lead to better overall productivity. Take the plastic bin liner out of your desk bin, look at it — when was it last cleaned? How about the window sills or horizontal ledges around your office… any fine dust accumulating there? It’s important to choose the right cleaner that goes the extra mile and takes care of these little things for you. It’s not enough to just come in, change the bin liners, do a half-hearted vacuum then call it day. Why not call us on (08) 6558 1862 and we can come out to your property and take a look to see if all the little things are being done by your current cleaner. Our quotes are always quick and obligation free. You spend a large part of your week at the office, don’t take chances on cleanliness.